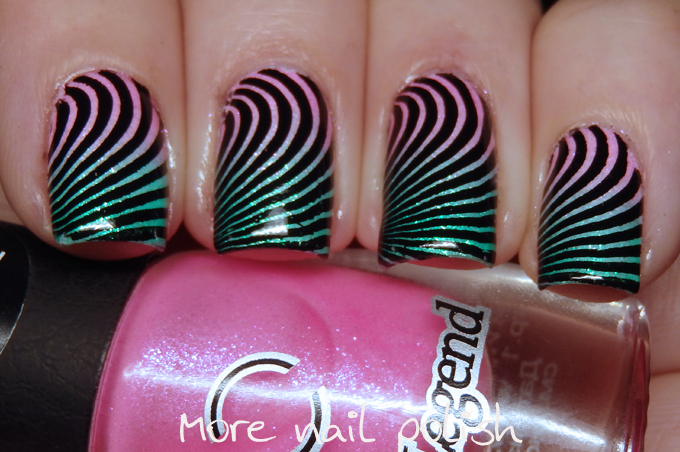 Continuing with some more Dance Legend polishes tonight. Here are two shades from the new Firefly collection. The collection feature eight shimmery shades that all glow in the dark. 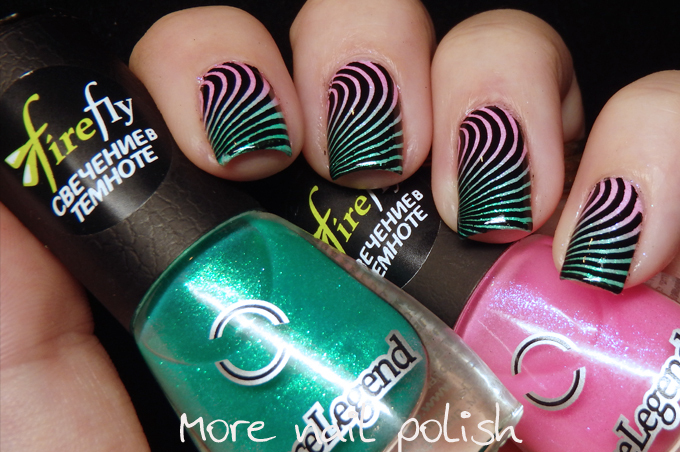 First let's look at the nail art look I created when wearing these polishes. I started with a white base to help the glow in the dark colours pop. 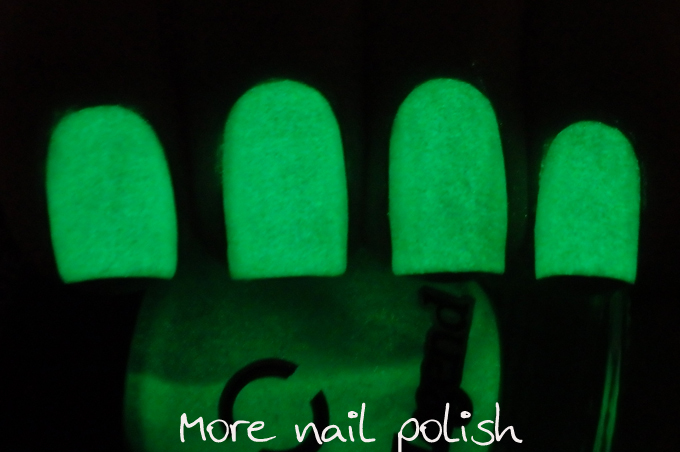 I then did a simple two colour gradient using the two glow in the dark shades, Green Monster and There She Goes. I then stamped with black polish and a design from JR 8. 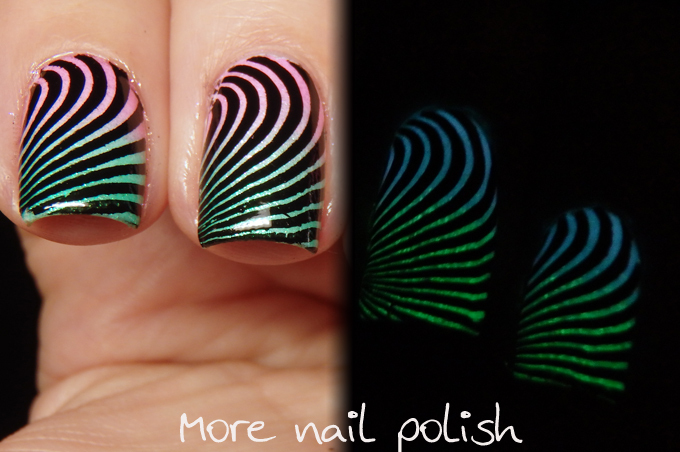 I'm channeling my inner Chalkboard Nails here with this two colour image showing both the regular view and the glow. Now to look at each shade on it's own. Green Monster - this is more green in real life, my camera makes it look bluer. 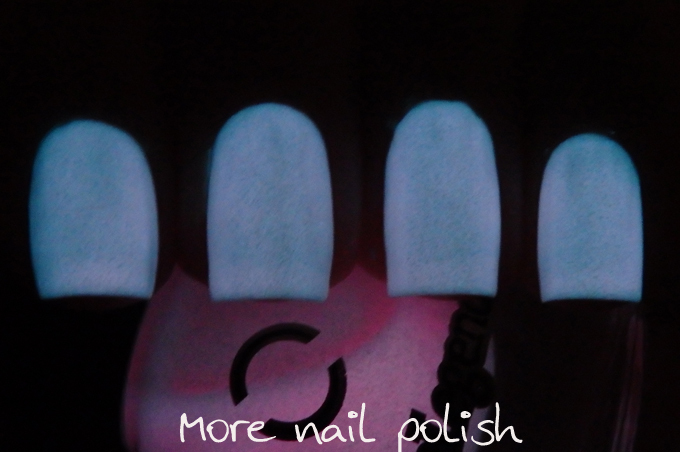 This is two coats over white, as again I wanted the glow to pop. 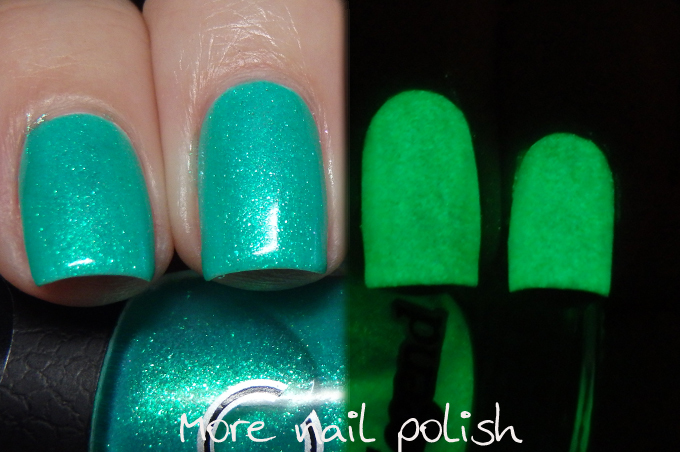 It has a gorgeous blue green shimmer and it glows really bright lime green. There She Goes - a pretty soft cotton candy pink and a strong pink shimmer. This is two coats over a white base. 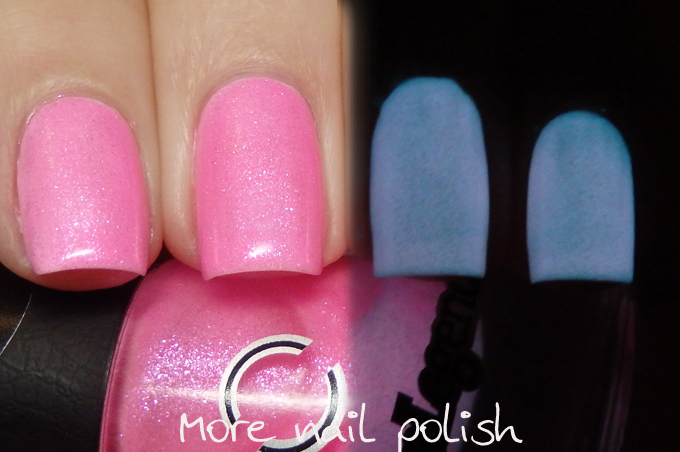 This is a funny one when it glows, in the bottle it still glows pink, but once it's on the nail it glows a light blue. I really love these, both in the natural shimmery form and in their glowy form. I still giggle like a little school girl when I look at my glowing nails when I climb into bed at night. I might just need to pick up the rest of this collection next time I place a Dance Legend order. 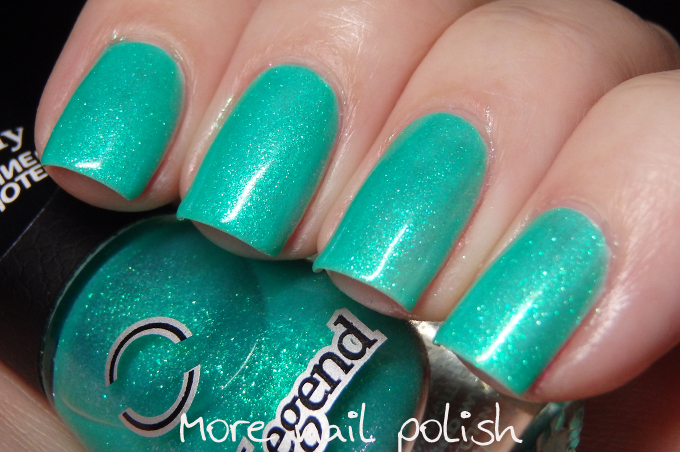 Dance Legend polishes are available from the Dance Legend website. International shipping is only $10 for up to 10 polishes, but if it's more than 10 polishes then shipping is free! The website also has details of other international stockists. 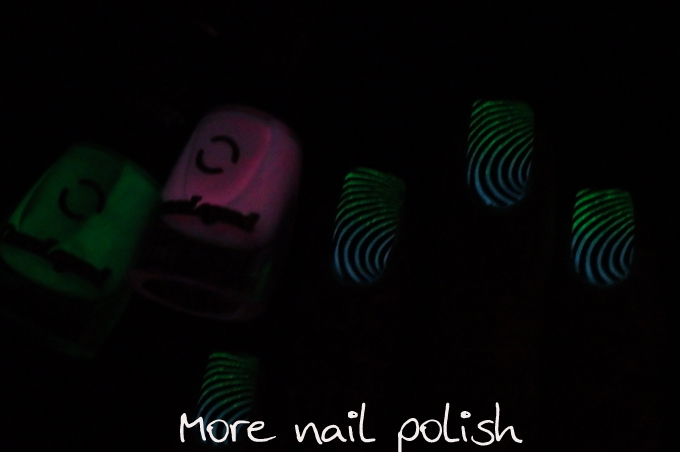 I love the glow in the dark effect on your nail art! This design is super cool! 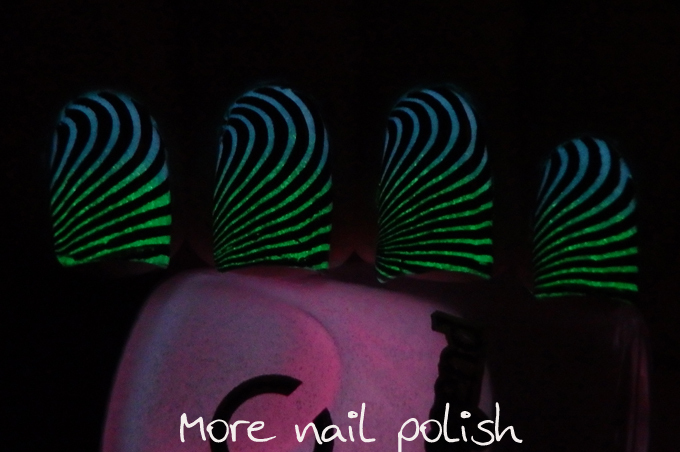 The gitd polishes are very pretty in their natural state as well.